Our guest editor this week is Pati Jinich, authority on Mexican cooking and author of Pati's Mexican Table. She'll be sharing a week's worth of recipes, choosing a Wildcard winner, answering our questions, and giving away a few copies of her book. 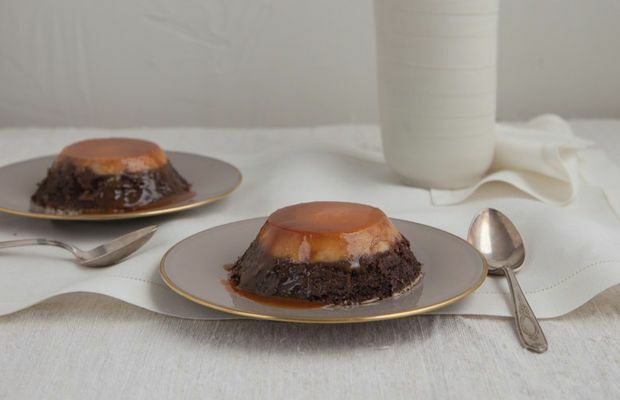 Today: A layer of chocolate cake batter makes the perfect complement to traditional flan. This traditional Mexican cake earned its infamous name from the magic trick that happens in the oven while it’s baking, but it is far from impossible. When you layer the flan and cake batters into the molds, you pour the cake batter in first, with the flan on top. It looks like a total mess, but in the oven they switch places and the chocolate cake batter ends up on top. It's magic! And it tastes magical, too: rich chocolate cake layered with creamy flan and liquid cajeta creates a confectionary masterpiece. Though it can also be made in a large round or bundt pan, I find it much more festive and easy to make personal-sized Chocoflans. They are perfect for an elegant dinner party or for an afternoon snack, and they are small enough that you couldn’ t possibly be expected to share. I forgo my job in the Washington DC policy research world to research, test, taste, cook, write, teach and talk about Mexican food. Not only because of nostalgia and desire to connect to my roots, but because I love sharing all I learn and I am fascinated by Mexico cuisine's richness and depth. This looks great. Seems like the fancier cousin of a pudding cake - but since you don't unmold that, the cake remains on top when served. Either way, it is magic!